Political campaign contributions made secure and easy. We make accepting political campaign donations via credit cards, debit cards and PayPal fast, easy and secure with no setup or monthly charges. 2.9% + $0.30 per transaction and no monthly fee. Accept political campaign donations in minutes. Online credit card processing for campaign contributions is as easy as adding a Donate button to your website. It is also mobile-optimized for quick and easy donations. Accept PayPal payments, bank transfers, and major credit cards (Visa, MasterCard, American Express and Discover). Political Fundraising made easier with PayPal. Helping you reach more donors. PayPal has millions of active accounts, all of them potential campaign donors. 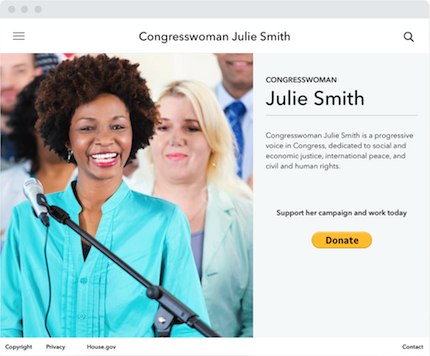 If you're looking for a full suite of services for your political fundraising organization or a crowd funding app to help you reach more people, our partners can help. 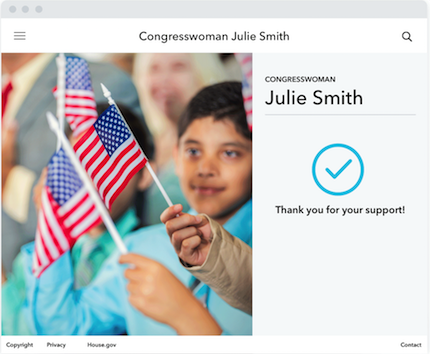 Once a Donate button is added to a political campaign website, supporters progress through the donation process quickly, smoothly and securely. The donor clicks Donate on your website. Before completing the payment, supporters choose the amount they wish to donate and review a summary of key information. The political campaign quickly receives funds into its PayPal account. Donors can be sent back to your site immediately after payment. 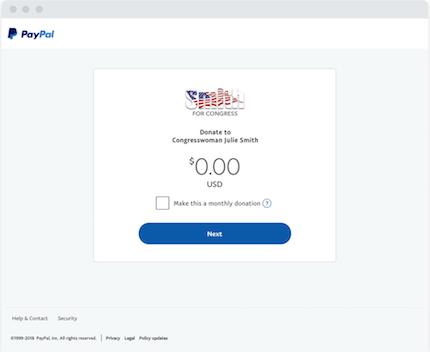 PayPal offers political fundraising tools that provide valuable information on every campaign contribution made through PayPal. Use these tools to stay on top of every campaign contribution. View a summary of campaign account activity each month. Export transaction information to Excel or fundraising software. Quickly find specific transaction records to answer donor inquiries. Offer controlled access to staff or accounting department to view the campaign's transaction history. Collecting FEC required donor information with PayPal. The Federal Election Commission requires all Federal campaigns to use best efforts to collect and report the name, mailing address, occupation, and employer of individuals whose contributions exceed $200 in an election cycle. 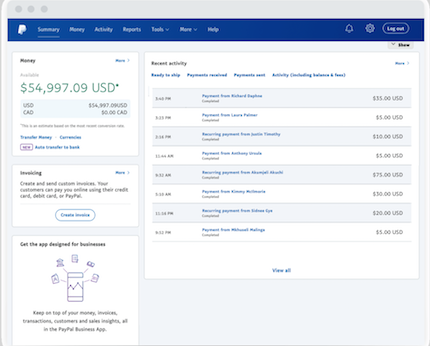 Because PayPal’s payment forms include customizable fields that help gather useful information, PayPal helps campaigns comply with FEC requirements. $0 per month 2.9% + $0.30 per transaction. You pay a low fee of 2.9% + $0.30 for each online donation, keeping costs and terms simple. There are no hidden charges, monthly fees, or monthly minimums. You can cancel at any time, and setup is free. How are the campaign funds accessed? Start putting campaign donations to work right away. When a donation is complete, the money shows up in the campaign's PayPal account usually within a few minutes. Automatically transfer money to a campaign's linked bank account daily, or manually schedule transfers to move the money whenever it is convenient. The availability of funds from the campaign's bank account is then subject to bank policies. What if we have our own team of web developers and programmers? How can my political fundraising organization begin accepting PayPal for contributions? Does PayPal offer discounts to political organizations? How will my organization receive contributions and payments made with PayPal? What type of reporting is available for contributions? Can my political fundraising organization use PayPal transactional data as part of its donor record? Political fundraisers can trust PayPal because we take security seriously. 24/7 fraud monitoring and detection help keep fundraising transactions secure. With PayPal, you can rest easy – we have your back.